Supreme Leader Ayatollah Ali Khamenei: The ultimate decision-maker on all major state and religious matters. He appoints all key positions in the ruling theocracy and controls judiciary and Revolutionary Guards. Supporters believe he is incapable of error and answerable only to God. Guardian Council: Vets all candidates for parliament, president and other elected posts. Power to veto any legislation. Comprised of six Islamic clerics and six legal scholars hand-picked by Khamenei. Expediency Council: A 32-member unelected group dominated by conservatives and led by former President Akbar Hashemi Rafsanjani. Mediates in disputes between Guardian Council and parliament. Advises supreme leader. Expert Assembly: A group of 87 Islamic clerics. Constitution says it oversees supreme leader, but actual role is unclear. President: Highest elected leader. Leads most aspects of government, but important decisions need backing of supreme leader. President serves for a four-year term. Two terms maximum. Prime Minister: The 1989 constitutional changes during Presidnecy of Akbar Hashemi Rafsanjani, removed the post of Prime Minister. Parliament: Structured as Western-style legislative branch, but all key measures by 290-seat chamber must have the backing of supreme leader. Main powers in setting budget and other fiscal matters. Law makers have four-year terms. 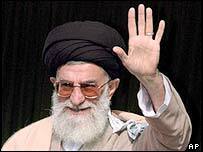 Supreme leader Ayatollah Ali Khamenei: Appointed for life, overrides all other authorities. It is extremely rare that people publicly criticise ayatollah Khamenei, who is regarded by his supporters as being incapable of error, and only answerable to God. Farsi News From Voice of America - Regional and world news in Farsi. Voice of America News & Views - Daily 30 Minutes program. Iran Weekly Press Digest - Independent bulletin of political, social, and economic affairs. Islamic Republic News Agency- Persian and Arabic headlines and radio broadcasts. Statements/News issued by NCRI- Archive of news and statements by NCRI. BBC World Service - Iran News in Persian(Farsi). Deutsche Welle's Farsi News Radio - Iran News from Germany. Farsi News From Voice of America - News, music, and radio programs in Farsi. INBC - Live 24 hours a day News and Music. Radio Aras - Voice of Democracy, Peace & Socialism. Radio Israel- Radio Israel in Persian. Radio Voice of Mojahed- Radio news programs in Farsi. Reza Pahlavi's interview with KRSI- June 25th, 2000, with callers from Iran. Voice of Worker-Communism - Sedaye Kommunisme Karegari. News and information about the organization. Webpage Created, Managed and Hosted by FarsiNet جدیدها. What's New?. صبح بخیر دوستان. Art. Audio - Sermons. Business. City. Bam. Culture. مشاوره مسیحی. Directories. Easter. عید رستاخیز. ePolls. Entertainment. Family. خانواده مسیحی. Farsi Sermons. Farsi . Good News!. Greetings. کارت تبريك. History. Humor. Injil. عيد كريسمس. Literature. Music. News. اخبار فارسی NowRuz. نوروز. Organizations. Persian Poetry. Persian Music. Radio & TV. راديو و تلوزيون مسيحى فارسى. Religion. روز ولنتاین. Video. Top 10 Sites. مجله تبدیل. Search. Conditions of Use. Privacy Notice. موسسه تعليم. Disclaimers. Email Policy. Trademarks. سوپرماركتهاى ايرانى. Statistics. Annual Reports. Our Mission. مجله شبان. Contact us. IranianChurch. IranCity. شب یلدا. IranTimes. PersianWeb. شعر فارسی و شاعران ايران. FarsiEats. FarsiMusic. FarsiNews. FarsiVideo. Gorbeh. راديو ندای اميد. ZanAmu. Iran Web Portal. Link to FarsiNet. 250,000,000+.